Petition for a free Licence to Busk! Complaints about the costs of presenting live music in Bonn have been many recently. It seems though that even music that costs the City nothing to organize is frowned upon by the powers that be here. 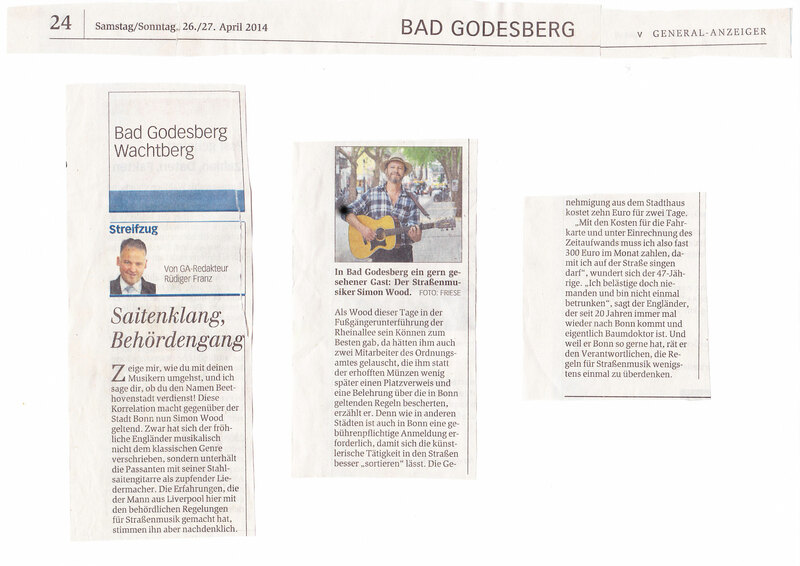 A Recent Article in the Bad Godesberg edition of Bonn’s General Anzeiger newspaper shows what happened to Englishman Peter Woods when he went busking in the area. Many of Bonns up and coming musicians learn their live trade from playing in the streets of Bonn. For this reason 3Songsbonn.com is joining with the Folk Club Bonn (from whom many of it’s regular young stars have have been ‘discovered’ busking in the City streets) and petitioning Bonn’s Lord Mayor for an end to the fee charged for busking licences. Please add your name to the PETITION HERE and help keep the streets of Bonn and the future of it’s music alive. The completed petition will be printed and added to the names already collected by Folk Club Bonn. KEEP BONN (A)LIVE.